The central character in Macabre is a taxi driver named Tony Dandridge. He is an ex-soldier who was invalided out of the army due to a fragmented bullet in his thigh. Tony still has to endure the pain from his wound and he has nightmares related to his experiences in the Falkland Islands. One way or another Tony finds it hard to sleep at night and, when the reader first meets him, he is sitting in his taxi at three o’clock on a cold and rainy morning. Tony is not just working the graveyard shift because he cannot sleep though; he is doing it because he needs the money. Civvy street is proving a hard ride for him, his army pension is not enough for him to live on, and he needs to work around the clock just to keep up with the payments on his taxi. So far it has been a quiet night and all he is doing is burning petrol. Tony’s first fare of the evening is a young American girl with a gun and a baby. Tony doesn’t mind the kid, but looking down the wrong end of an automatic pistol does little to improve his mood. Yet what can he do? You can’t argue with a lady who has a gun so he does as he is told and he is told to drive. Tony can tell by the look on the girl’s face that she is being followed by someone and that she is terrified, but the girl is not interested when he advises her to go to the police, and by the way she is acting, Tony begins to wonder if she might be on drugs and when she finally tells him to stop the car he fears she may empty her gun into his head. Tony need not have worried because the girl saves her bullets and before she disappears into the night she actually pays him. She even allows him to keep the change. Tony has had enough for one night though and chapter two finds him at home in his flat, where he fears that he will never get to sleep after all that has happened to him. Sleep does come though and he must have been sleeping pretty soundly as well because he does not hear anyone enter his room and is unaware that anything is wrong until he wakes up from a bad dream and finds that for the second time in just a few hours he has a gun in his face. This time it is a man doing the honours. He is looking for the girl and her baby and he thinks that Tony knows where they are. When Tony explains that he has no idea where the girl is the stranger does not believe him and, for a while, things do not look good for Tony, but a little bit of army training goes a long way and it is not too long before, for the first time that night, Tony is on the right end of the gun and is the one asking the questions. His guest is not the talkative type though, and he dashes from the room, calling Tony a liar and warning him, “You’ll be sorry for this Dandridge,” and “Something will come for you Dandridge.” Tony is, as you might expect, a little surprised that the stranger knows his name, but at that point he wonders little about what the ‘something’ might be, and when the ‘something’ does come for him it is such a strange — and very dangerous — ‘something’ that Tony has little doubt who has sent it; even if he does find it hard to believe what he seeing, and one of the first things that Tony sees is his landlord Mr Sangster being ripped to pieces inside the maelstrom of swirling air and evil energy that was sent for him. It is a scary sight and Tony does what any self-respecting old soldier would do when faced with something that looks like it is out on a day ticket from hell: he makes a run for it while the thing is still busy turning Sangster into a jigsaw puzzle. Tony spends a lot of the book running from the entity and he eventually meets up again with the girl and her baby. Her name is Lauren, the baby is called Sparrow and Sparrow is not an ordinary baby. He is empathic and when Sparrow realized that he and his mother had placed Tony in danger he instructed his mother to find Dandridge, in the hopes of telling him how to protect himself from the entity that is after him. Once these three find each other again, however, Sparrow realizes that things are not as simple as he thought because they are destined to stay together and need each other if any of them are to survive. Macabre is 440 pages long and it a great book that I can wholeheartedly recommend to any fan of horror fiction. Tony, Lauren and Sparrow are fascinating and likeable characters and they share book space with plenty of other characters who are just as interesting. Take, for instance, Ranjana, a fifteen year old Asian girl who has premonitions and is fleeing an upcoming arranged marriage. She might have escaped her family, but she has found herself living on the street and it is there that she meets the street-smart Randall who has problems of his own and, like her, is also homeless. The circumstances in which they meet are less than ideal. Ranjana was about to be gang raped and if it were not for Randall’s gutsy intervention she would have probably been killed as well. A lot of the scenes in Macabre take place on the streets because the nations homeless play a big part in the story. An illicit cult called The Church of the Sabbarite is preying on them and the murdering of street people plays a big part in their rituals. One of the nastiest characters in Macabre is a part of that cult. Her name is Lorelei, she has empty eye sockets, but she is not blind. She can see just fine and can slice and dice the homeless as efficiently as any of the other Sabbarite. Better in fact because that is what she was created for. Another interesting and very nasty character is initially introduced to the reader as The Man Who Shines Black because this is how local hard man, Gerry, always thinks of the shadowy presence whenever it materializes in front of him. Gerry sees the man as a kind of father figure and the man says that Gerry is special and that he has big plans for him. As you can probably appreciate, there is a lot going on in Macabre and I have not even mentioned the people returning from the dead or the derelict named Mac who the other street people look upon as a kind of new messiah. Like I said lots happening and even though some aspects of the story are rather fantastical in nature Laws makes it all seem very real and believable. Macabre is not going to suit everyone’s taste and if the dark fantastic does not appeal to you then, fantastic as this book is, it probably isn’t going to be for you. 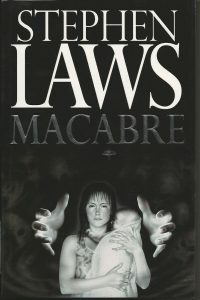 Most horror readers should enjoy Macabre though. The blood and gore content is not over the top, but when it splatters out from the paragraphs it is nasty enough to appeal to those readers who seem to expect such things from a horror novel. On the other hand, though, there are also enough supernatural elements to the story to appeal to those readers who prefer the thrill of the chill as the goose bumps crawl their spine. I tend to fall into this latter group, but will read any story as long as it is a good story and Macabre is one of the best. If you don’t believe me read it and see. I dare you.